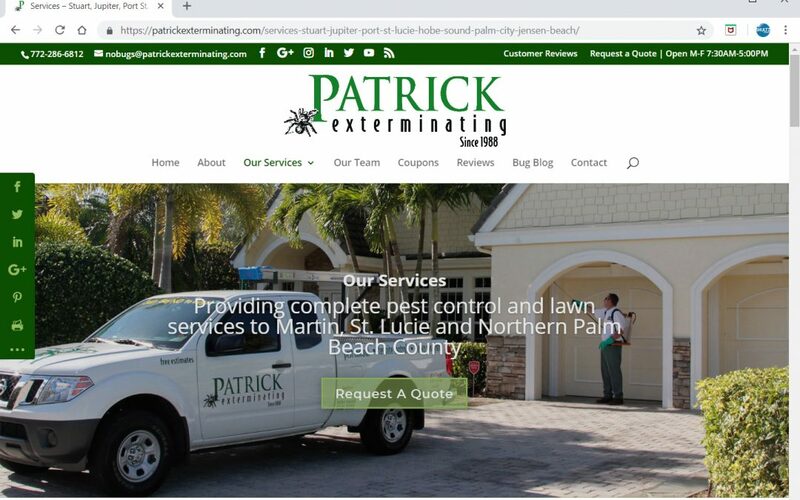 Shultz Communications Florida is very excited to announce the launch of a new fully responsive and socially integrated website for Patrick Exterminating, a leading pest control company based in Stuart, Florida, serving Martin, St. Lucie and Northern Palm Beach County. The project was a team effort with valuable input provided by company owners, managers and employees and professional photography and video support from our affiliate Beach Nuts Photography. Visit the website at www.patrickExterminating.com. – Discover how the company began with one employee and one truck in 1988 at https://patrickexterminating.com/about/. – Find out everything you need to know about unwanted household pests and ways you can help keep your home pest free at https://patrickexterminating.com/services-stuart-jupiter-port-st-lucie-hobe-sound-palm-city-jensen-beach/. – Meet the Patrick team at https://patrickexterminating.com/our-team/. – Take advantage of money-saving coupons at https://patrickexterminating.com/coupons/. – Schedule a no-obligation FREE HOME PEST INSPECTION at https://patrickexterminating.com/contact/. We are proud to serve the marketing needs of this trusted business that has built its reputation treating customers like family while giving back to the community. It’s relationships like this that validate the work we do at Shultz Communications Florida. We look forward to building future business for Patrick Exterminating through the implementation of a strategic online marketing program that includes ongoing search engine optimization (SEO), targeted social media messaging and the latest Google business marketing tools.